Facebook rolled out a limited test tonight of a new search interface which for the first time lets people search their News Feeds and brings up results chronologically from their streams. The new search interface is still experimental and has only been turned on for “a fraction of a percent of the people” on the social network. I am one of the lucky few. My initial impression is that this is the first time I’ve actually been able to find anything on Facebook without having to jump through 25 hoops to get the results I want. The ability to search my personal stream with results coming back in chronological order is key. 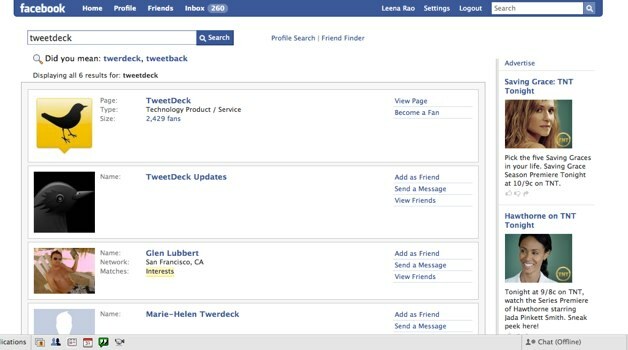 This is how Facebook will do real-time search. For instance, if I want to see what my friends think about the new TweetDeck apps which just launched tonight, I can see all their comments on the subject, followed by comments from everyone with a public feed whether they are my friend or not. In the right-hand column are page and people results. With the test, you will be able to search your News Feed for the most recent status updates, photos, links, videos and notes being shared by your friends and the Facebook Pages of which you’re a fan. You will also be able to search for status updates, posted links and notes in Search from people who have chosen to make their profile and content available to everyone. This is a much better search experience than what most people must suffer through currently. When most people type in a keyword in the search box, Facebook will still default to searching their friends or all of Facebook. Search results favor people’s names or pages which contain the keyword (see screenshot below). If you want to search for an application, for instance, you have to click on application search specifically. The new experimental search results are more unified. The central results are from your feed, and results from the rest of Facebook (people, pages, groups, applications) are presented on the side when relevant, or you can filter the results by type. 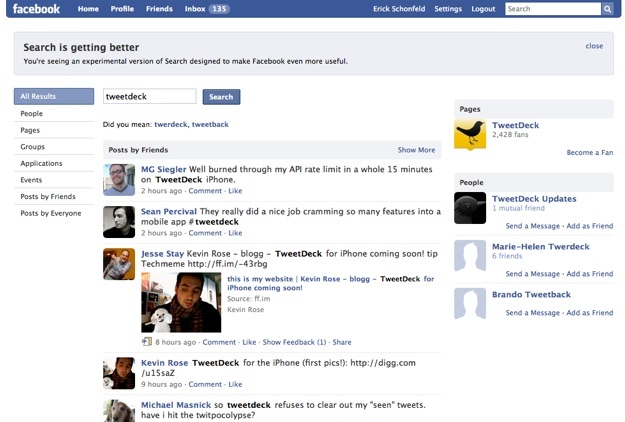 Facebook cannot afford to cede real-time search to Twitter. Search becomes a form of navigation when information is thrown at you in a fleeting stream. The only way to recover the past or discover something you missed is through search.